Hydration is one of the key foundations of health. But conflicting information from medical doctors and other health practitioners makes it difficult for people to know how to stay properly hydrated. Understanding the role of hydration in maintaining health helps you determine how to use water to improve your health. Achieving Health Through Hydration Water is an essential element in a large number of biological processes that occur in the body. It supports digestion, circulation, and the ability of the muscles to contract and function. Water helps your detoxification system rid the body of waste products. Not drinking enough water to meet your needs impairs digestion and can lead to fatigue. 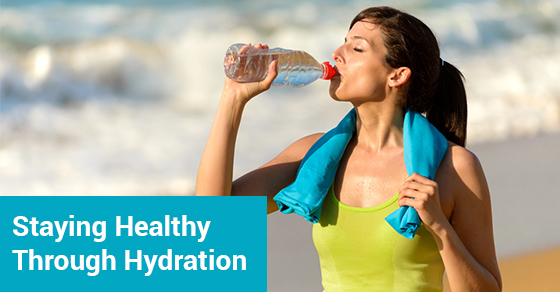 Significant levels of dehydration can lead to serious issues such as colitis and heartburn. By drinking enough water, you prevent many common symptoms and reduce the need for medications for ailments. The following are 5 health benefits of keeping hydrated. Heal the Digestive System Proper hydration reduces the risk of bloating, ulcers, acid reflux, and irritable bowel syndrome (IBS). Individuals who suffer from constipation often find relief by simply increasing their water intake. Weight Management The cells of your tissues and organs must be fully hydrated in order to function properly. Dehydration leads to signals to the brain that more nutrients are required. This can increase the feelings of hunger and cause you to overeat. By keeping your cells hydrated, you support their optimal function and improve their metabolic balance. Support the Immune System Dehydration leads to the production of histamines. These are compounds that are essential to the regulation of your immune system. A high level of histamine production leads to allergy symptoms such as sneezing, congestion, and respiratory issues. Regulate Blood Pressure Over 90 percent of the blood is made up of water. Proper hydration regulates blood viscosity to ensure that it moves freely through the circulatory system. Dehydration can cause the blood to become thicker, which reduces its circulatory rate and increases pressure to the walls of the arteries and veins. Support Detoxification Proper hydration leads to efficient detoxification of toxins. When the detoxification system is compromised, you experience more symptoms related to the skin. These include dermatitis, acne, psoriasis, and the early onset of fine lines. The skin is a part of the immune system, so any issues related to detoxification can lead to blackheads, redness, and other common skin ailments. These 5 health benefits of keeping hydrated will help you prevent the health issues that many people experience. By simply increasing your water intake, you’ll provide your body with what it needs to maintain optimal health.